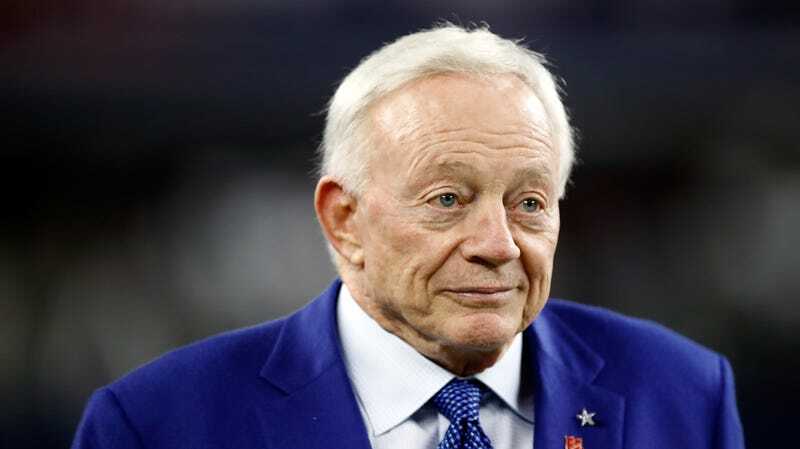 Jerry Jones Claims 18-Game Season Would Be "Better For Players"
Jerry Jones Thinks You're Stupid Enough To Believe An 18-Game Season Would Be "Better For Players"
Roger Goodell and the NFL owners have been agitating for an expanded regular season for a number of years now. Back in 2010, Patriots owner Bob Kraft called the idea of an 18-game season “a win-win all around,” and Goodell said, “There’s a tremendous amount of momentum for it. We think it’s the right step.” Though a lot of that talk died down after the 2011 lockout, Cowboys owner and wrinkly muppet Jerry Jones is bringing it back—perhaps because there’s another work stoppage looming in 2021. Whatever the Cowboys’ “studies” say, it’s impossible to see how more football for the first-string players and less conditioning for all will benefit anyone besides the owners and their wallets. And while Jones is right that preseason is dangerous—and it definitely should be shortened—it’s laughable to think that, with less time for teams to practice and get in shape, Weeks 1 and 2 of an 18-game season will be any better. Until Jerry Jones can find even one player willing to agree with him that an 18-game regular season would in fact be better for overall player health, he should just be honest about why he’s pushing for two more games to be added to the schedule: he wants more money.